LIVING ROOM 10′ 9" x 15′ 3" (3.28m x 4.67m) Spacious airy room with plenty of original features, Timber flooring, feature coving, exposed brick fire place with feature log burner effect electric fire, radiator, and window to front aspect. BEDROOM 8′ 9" x 13′ 7" (2.67m x 4.16m) Good size double room with feature built in storage cupboards, timber flooring, and window to rear aspect. BEDROOM 1 11′ 0" x 15′ 0" (3.37m x 4.58m) Very spacious double room, with timber flooring, coving, cast iron feature fireplace, builtin in wardrobe, shelving for ample storage, and window to front aspect. BATHROOM/ SHOWER ROOM/ WC Modern bathroom that needs a small amount of finishing off. Walk in shower, with hidden chrome taps and shower head. Tiled flooring, and walls. Opening to: tiled flooring, freestanding cast iron roll top bath, mixer taps. Edwardian style white sink with pedestal and W/C. Down lighting, extractor fan, and Small feature window with front aspect. OUTSIDE Garden surrounded with original stone wall, flower beds, and mature shrubs, with an elevated view across Newton Abbot and far reaching across to Haytor. This garden really has potential to be a little gem. LOCATION Tudor Road is situated in a convenient location just off the town centre with easy access to all this popular market town offers. There is a lawned open park area close-by. Newton Abbot offers a good range of shopping and leisure facilities and a mainline railway station. The coastal resorts of Torbay and the Cathedral City of Exeter are within a short drive via the A380. DIRECTIONS From Halcyon Road B3195 continue over the traffic lights passing Asda supermarket onto the A382, at the next traffic lights (Wolborough Junction) turn left onto the A381 continue over the traffic lights and turn right onto Tudor Road. Follow the road around to the left where the property will be found on the left hand side. DESCRIPTION Viewings come highly recommended to appreciate the character and spacious accommodation this charming and conveniently situated terraced home offers. The property benefits from gas central heating, gardens and resident parking. The property would make an ideal first purchase, family home or investment. Situated on the fringe of Wolborough Hill, this charming three Bedroom Town House offers spacious family living accommodation and would suit purchasers who are seeking a convenient, central location with easy access to the town centre and its range of amenities. The property which has been upgraded over recent years still retains the character of the original property and benefits from gas central heating. There is still room to improve by stamping your own personality to the property. The accommodation is laid over 3 floors and comprises Entrance Hall, Lounge, a double bedroom and stairs rising to the First Floor. 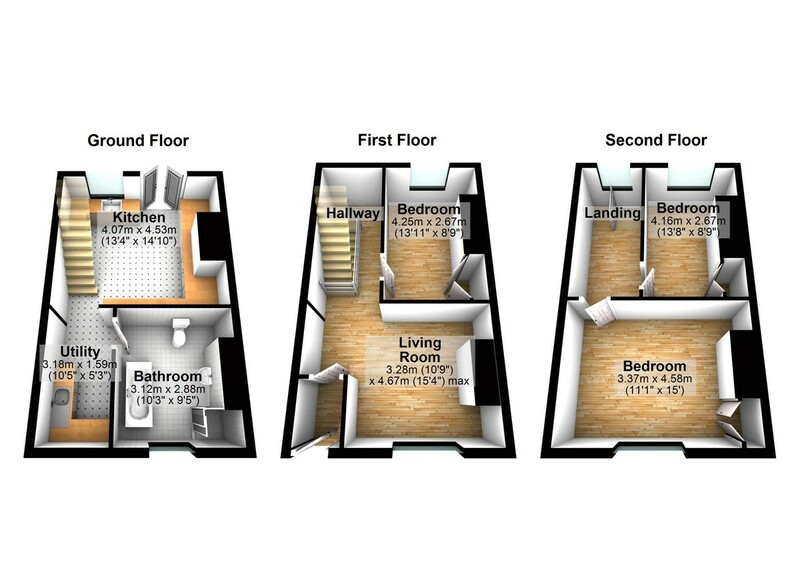 There are then two Double Bedrooms on the First Floor. The Lower Ground Floor comprises a spacious Kitchen/Breakfast Room with access onto the rear garden, a utility room and a 3-piece Bathroom with roll top bath.